The Arc Jacksonville provides many exciting opportunities for employment. We match talented, energetic, enthusiastic people with rewarding jobs giving you the opportunity to make a positive difference in the lives of people with intellectual and developmental disabilities. 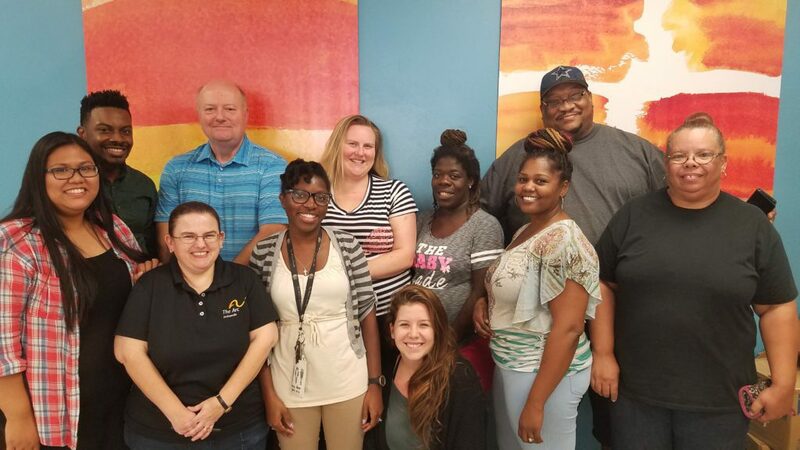 A well-established agency with over 50 years of service, The Arc Jacksonville is a leader among nonprofit organizations in the Jacksonville, Florida area. Employment applications are reviewed to ensure that you meet minimum qualifications. They are then provided to hiring managers who will contact applicants directly if they choose to arrange interviews. To provide supervision to a group of individuals working in a sheltered workshop setting. Supervise individuals in daily work tasks and ensure production schedules are met. Train employees in the development of work tasks and ensure the quality of the final product. Maintain production, attendance, payroll and training records for individuals in the program. Experience working with individuals with developmental disabilities is desired. Must have good communication skills and be energetic, reliable, patient, and responsible. Must have valid Florida driver’s license and reliable, insured transportation. Must be able to pass a DOT physical and be capable and willing to drive agency vehicles. The Arc Jacksonville lifestyle encourages independent living, socializing and sharing among community members and promotes community engagement to enjoy the educational, employment and recreational opportunities found throughout the thriving metropolitan Jacksonville area. We are currently looking for a full time (evening and weekend hours required) person with a passion to work with individuals with intellectual and developmental differences to join our team. In this role, the Activities Coach will assist in the creation, implementation, and administration of social activities both within the Village community and in the greater Jacksonville community. High school diploma or GED required. Associates degree with a major in public administration, public health, nutrition, education, or any related human services field preferred. A minimum of one year of direct experience in recreational and social programs. Prior experience serving people with intellectual and developmental differences preferred. Must have valid Florida driver's license with good driving record and at least three years of driving experience. Must have reliable, insured transportation. Must be able to pass a DOT physical and be capable of and willing to drive agency vehicles. This position is part time 15 to 20 hours per week. Hours: 10.5 hours dedicated Tuesday evening 5:30 p.m. to 8:30 p.m., Thursday evening 5:30 p.m. to 8:30 p.m. and Sunday morning 9:00 a.m. to 1:30 p.m. for shuttle driving. Associates degree with a major in nursing, education or a social, behavioral or rehabilitative science and two years or experience; or a bachelor's degree with a major in nursing, education, or a social, behavioral or rehabilitative science. Must have excellent organizational, verbal and written communication skills, interpersonal skills, effective goal setting and implementation, and creative and effective problem solving skills. Must have experience in disability services (at least one year of direct service to persons with disabilities); preferred experience in personal caregiving and/or home aide services. Must have demonstrated knowledge of community resources and services, how to address independent living needs and goals, provide individualized training to persons with disabilities, and work within a team environment. Must be comfortable and effective communicating in public speaking settings and training workshops. Must have valid Florida driver’s license and reliable, insured transportation. Must be able to pass a DOT physical and be capable and willing to drive agency vehicles. Assist individuals with developmental differences in identifying their job goals, interviewing, obtaining on the job training/employment within the community, training and job follow along. Interfacing with employers, caregivers and staff to ensure individuals are successful in their training/employment endeavors. Work with employers to develop job training sites and contracts. Bachelor's Degree with a major in business, nursing, educational or social, behavioral or rehabilitative services plus a minimum of one year of experience working in the field of employment, counseling, job placement, job coaching or public vocational rehabilitation program required. One year of documented experience working in the above listed fields may be substituted for each year of college education. Must have excellent written and oral communication skills and organizational skills and be capable of completing the required paperwork as scheduled. Must be dynamic, energetic, enthusiastic, flexible and dependable. Must have valid Florida driver’s license and reliable, insured transportation. Must be able to pass a DOT physical and be capable and willing to drive agency vehicles. To provide supervision of individuals with developmental disabilities in a residential setting to ensure safety, comfort, and protection of individual rights. Provide direction, assistance and support for all aspects of self-care and daily living activities. Assist in dealing with medical, behavioral, and emotional issues. Assist in meal preparation, laundry and housekeeping chores. Complete required documentation and paperwork. Minimum of one year experience working with individuals with developmental disabilities is required. Must have good communication skills and be energetic, reliable, patient, and responsible. Must have valid Florida driver’s license and reliable, insured transportation. Must be able to pass a DOT physical and be capable and willing to drive agency vehicles. Independent Living Mentor- Uses creativity to facilitate a variety of activities to build skills and enhance the lives of individuals with disabilities while promoting community inclusion. Work Readiness Mentor- Facilitates training courses which prepare individuals with disabilities to enter the workforce. Assists students in securing internships on UNF campus. Wellness Mentor – Assists individuals with disabilities in living more healthful lives, from nutrition, to fitness, to stress management, etc. Academic Advisor – Tutors individuals with disabilities in basic reading, math and language skills; Pre-GED coursework; provides in class support. Financial Literacy Mentor – Provides critical assistance in improving the understanding of budgeting and basic money management. Volunteer Recruiter – Networks and engages the community to volunteer within the agency. Members are required to attend monthly meetings, all required training, and community service projects as scheduled. A demonstrated record of leadership and community service is required. A 12 month commitment is required. Candidates must pass a drug screening, as well as local and federal background screenings. AmeriCorps service begins early August with a mandatory 2 week orientation & training. Service is completed at the end of July the following year. Part Time members serve an average of 20 hours/week and receive a biweekly stipend of $250. Upon successful completion of service a $2,750 Education Award is granted. Interested candidates should send a resume and cover letter to kgiusti@arcjacksonville.org. Experience working in the field of developmental disabilities with knowledge of supports and services available to the disabled community. Excellent written and oral communication skills. Excellent organizational and time management skills. Experience working in all Microsoft Office software and presentation software. Valid Florida Driver’s License with reliable, insured transportation. ** Education may be waived at the discretion of the agency. Responsible for all aspects of managing the AmeriCorps grant to include: recruiting AmeriCorps members, developing service descriptions, managing sites for service, documentation training and writing AmeriCorps reports and satisfying AmeriCorps Project Director requirements. Responsible for the management of Club Arc. This position interfaces with Arc personnel in every location and particularly at UNF. Position also seeks outside service opportunities for members. Demonstrated success in achieving professional goals and the ability to work independently. Knowledge and experience working as a team member. Working knowledge of Microsoft applications. Excellent written and verbal communication skills. Grant writing experience. Excellent organizational skills. Must enthusiastically embrace the notion that individuals with intellectual and developmental differences are valued members of our community and should have an array of cutting edge and quality services and supports to choose from. Must be comfortable and effective communicating in public speaking settings and training workshops. Must have valid Florida driver’s license and reliable, insured transportation. Must be able to pass a DOT physical and be capable and willing to drive agency vehicles.